LOUISVILLE, Ky. (September 15, 2017) – Kentucky electric cooperative crews providing mutual aid in Georgia can see the light at the end of Irma. Five days after Hurricane Irma knocked out power to more than 550,000 electric cooperative customers in Georgia, co-op crews are working on the final 6 percent without power, about 34,000 co-op members. More than 150 linemen from 19 Kentucky electric cooperatives have joined 4,350 linemen and hundreds of support personnel from 14 other states to assist in Georgia. • Repairs were delayed in some cases until severe winds moved through and it was safe for employees to resume work. • Outages have been located in many areas that were inaccessible due to standing water and roads blocked by fallen trees and other debris. • Crews have been cutting their way into many areas before repairs begin. • Workers have been replacing record numbers of broken power poles (surpassing previous records at many EMCs). Pole replacements are notoriously time- and labor-intensive—one pole replacement can take as much as four hours. • Crews have been working in unusually wet conditions, making it tough on employees, trucks, and equipment. 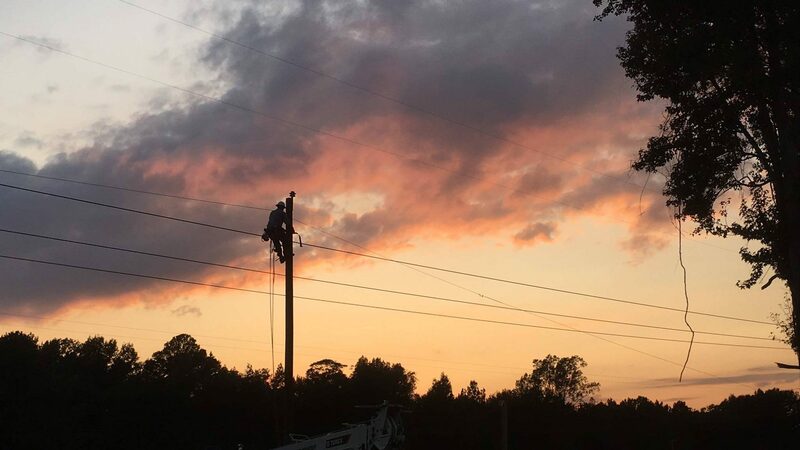 Through careful coordination with co-op officials in the region, including the Kentucky Association of Electric Cooperatives, the linemen from electric cooperatives across Kentucky are assigned to individual Georgia co-ops who have requested their assistance. In addition to co-op employees, Kentucky co-ops released line construction and right-of-way contract crews to respond to both Irma and Hurricane Harvey. The top priority of each local Kentucky co-op is service to its own member-owners. Before committing resources to mutual aid requests, each co-op ensures it has ample crews available for all local needs, including routine maintenance and emergencies.